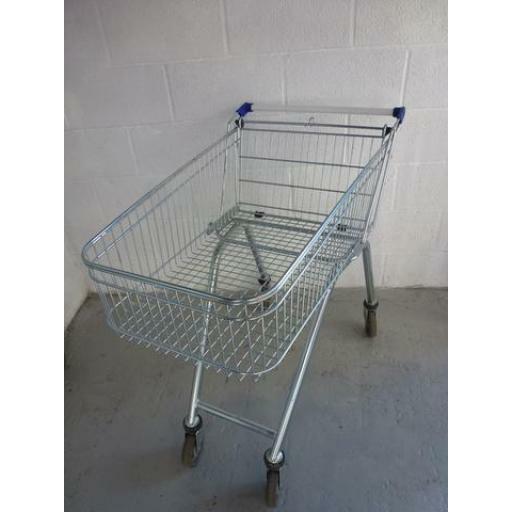 A very popular shallow shopping trolley. This is the size you see in larger supermarkets such as Tesco and Sainsburys and is known as a daily shopper, easy shopper, shallow shopping trolley and more. Popular with customers as no bending required at the checkout. All our refurbished trolleys are fully serviced, any welds or maintenance work done and new casters fitted where necessary. Unlike in the used version of this trolley available in our used trolley section to fully refurbish this trolley we then take it to be re-plated so it looks shiny and new. They are a great option if you have a limited budget.